Heat a grill pan over high heat or set a grill to high (you can also use a broiler.) Preheat the oven to 400° F. On the stove top, bring a pot of water to boil for parboiling and blanching. until grill marks are apparent. Remove them to a roasting pan and finish cooking them in the oven, about 3 to 7 minutes (depending on the vegetable. ); until flexible but not mushy. When done, salt and pepper them, drizzle with some of the olive oil and set aside. and pepper, slice the mushrooms into ¼- to ½ inch wide strips, and set aside. Over an open flame or under a broiler, roast peppers, turning when necessary, until their skin is charred and blackened. Hold them under cold water and peel off the skin. Pat them dry. Seed and slice them into ½ -inch wide strips. Drizzle them with more of the olive oil, season with salt and pepper, and set aside. Blanch the sun-dried tomatoes in the boiling water for 1 to 2 minutes. Remove and pat dry. Coat them in more of the olive oil. 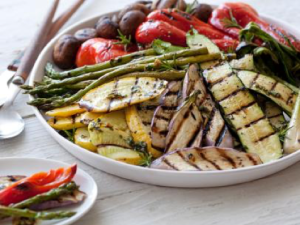 Arrange the platter by rolling each of the lengths of eggplant, zucchini, and carrots, then fanning them on the plate. Intersperse the rolled vegetables with the mushrooms, sun-dried tomatoes, pepper, and the mixed olives. Drizzle the entire platter with remaining olive oil and reduced balsamic vinegar to taste and serve. This dish can easily be done a day or two ahead; just be sure to bring up to room temperature before serving and wait until serving to finish it with the final drizzling of olive oil and vinegar.